The father should be Abram, but I have seen a few spellings for him. The child (my father's second cousin) is also indexed by the Mlawa archives as "Uszer" but I have seen him mentioned elsewhere as "Aser" although I suppose one might be Polish and the other Yiddish or Hebrew. im sorry, of course the child's father given name is Abram. Can you please translate record. Could someone help me understand the "fine print" on this birth/baptismal record? 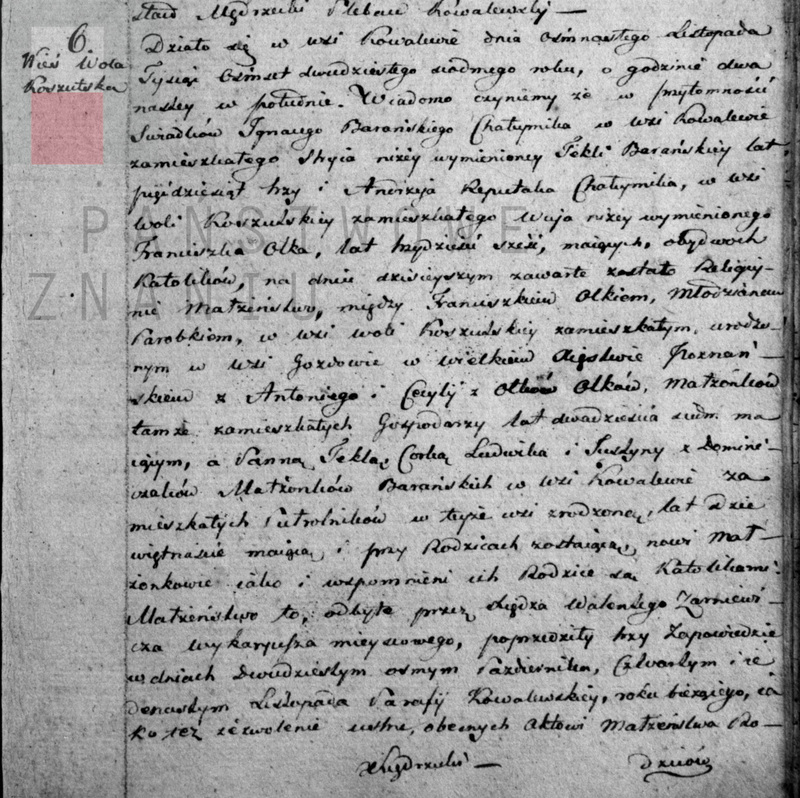 It is dated 6 Mar 1897 and appears among records for Giedlarowa natives. Marianna's mother appears to be Agnieszka, the daughter of Andrzej Niemczyk and Agnieszka Gondek (Gadek). Or is Marianna a child adopted by Agnieszka? Other details in need of explication are: the place names Wysockiego and Ustrzyki, the dates 2 Jun 1905 and 19 Dec 1905. And what about the date (1930? 1950?) 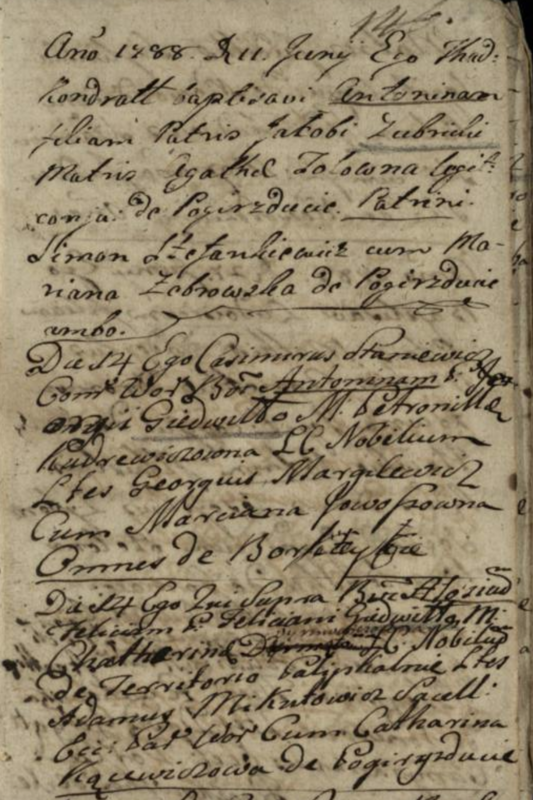 to the right of the record, where (presumably) the godparents' names appear? this records are written mostly in latin language. Thanks- I should have observed that. Sorry to have posted here. 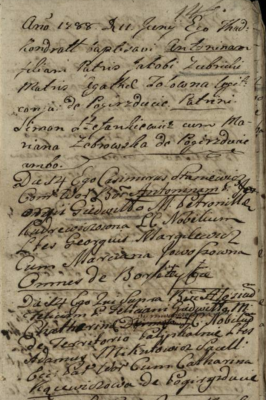 Could someone assist me with translation these two birth records from Varniai parish? ***A border judge had to be a nobleman and acted only on the eastern frontier territories of the former Polish-Lithuanian Commonwealth. 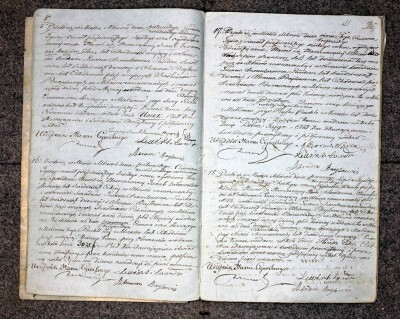 He judged the disputes between the subjects of both countries to the company with Russian judges. Can you please translate this record - Not sure what language. It happened in the city Mława on the 15th/27th day of June 1856 at 8 a.m. Appeared orthodox jew Szaul Furmański, grain traider, 40 years old in the presence of the witnesses Lewin Szmulowicz Landau, teacher, 69 years old and Abram Bajlowicz, 45 years old, synagogue teachers living in Mława and presented Us a male child born on the 2nd/14th day of June of the current year with his wife Sura nee Enzlowicz, 30 years old. At the circumcision rite the child was given the name Uszer. This act was read aloud to the declarant and witnesses and signed. Much appreciated once again Marcel. It happened in the village Kowalewo on the 18th day of November 1827 at noon. Tekla Barańska, a miss, daughter of spouses: Ludwik Barański and Justyna Barańska nee Dominiczak, halffarmers** living in the village Kowalewo. She was born in the village Kowalewo, 19 years old, living with her parents in kowalewo. Newlyweds and their parents are romancatholics. Religious marriage ceremony celebrated by the priest Walenty Zarniewicz, Kowalewo parish vicar. This marriage was preceded by 3 banns on the: 28th day of October, 4th and 11th day of November of the current year in Kowalewo parish. 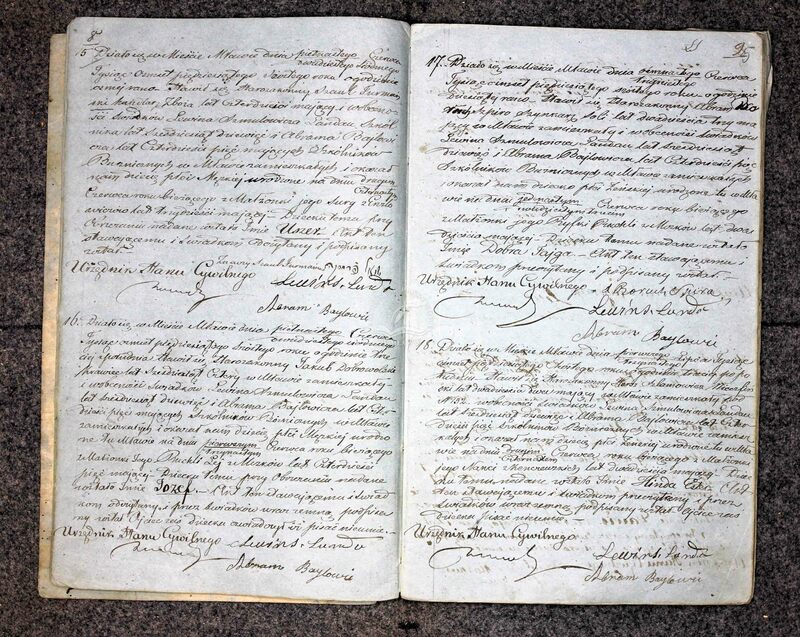 Newlyweds parents, present during writing this marriage act gave oral permission for this marriage. This act was read aloud to the newlyweds and witnesses and wasnt signed by them because they are illiterate. 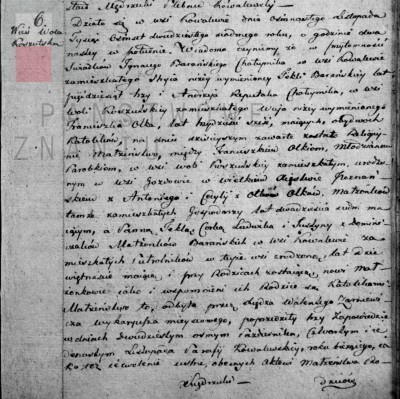 priest Stanisław Mędrzecki signature, Kowalewo parish parson. **półrolnik, literaly halffarmer: farmer with 12 morga to half włóka of land. Morga and włóka are land measurement units. Thanks for your assistance - very helpful. Question for you. I know that the first/other record is in Latin, but I was thinking that the baby in the Latin record might be the father in the record that you translated (the Polipkalnie village was very small, and I think there was only one Giedwillo family in it at any point in time) - however the spelling of the first name looks slightly different (I assume the name is in Polish, or would it be in Latin too?). Can you look at the name in the other record and offer your opinion?